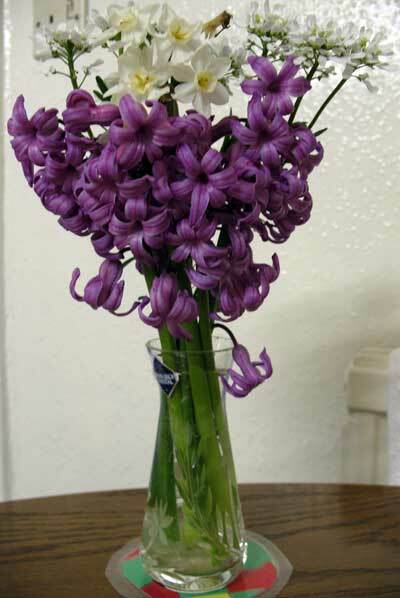 Fresh flowers from the garden are a lovely addition to your home as they bring a little bit of the outdoors inside. I have been inspired by Fiona from The Cottage Smallholder to have fresh flowers from the garden in my house, so thanks Fiona. This little vase of fresh flowers has fragrant hyacinths, petite white daffodils and an unknown delicate white flower. I placed this little posy of flowers in the vase on my kitchen table and the hyacinths produced a wonderful fragrance that filled the room. The pretty vase of flowers, the lovely fragrance and the knowledge that these beautiful flowers were a free gift from our garden has inspired me to continue to look for flowers that I can cut for the house. In the Winter you can always order flowers by post to get the same outdoors feel when your garden isn’t in full bloom. I dedicate this post and the pretty posy of flowers to Fiona @ The Cottage Smallholder who gave me the inspiration to cut fresh flowers from my garden.